Have you ever wondered what the M in front of your beloved M800 stands for? Do you have a DEF nib on an old Ibis and think to yourself what does that D stand for? 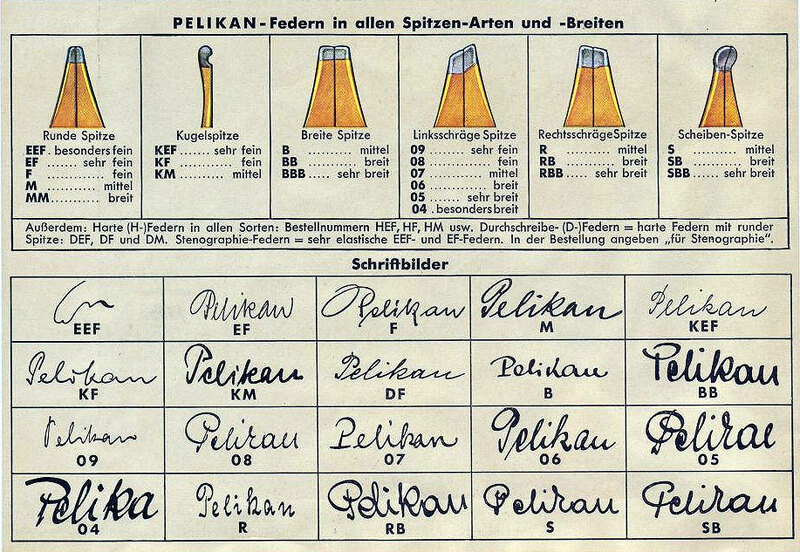 Read on for a quick breakdown of what Pelikan’s letter designations stand for as gathered from various sources. Of course, I strived to make sure the following list is as factual as possible but there is always room for error, especially since I have no understanding of the German language. If you do see an error, please feel free to let me know so that I can make the appropriate correction. Many of these terms can also be found in the glossary. 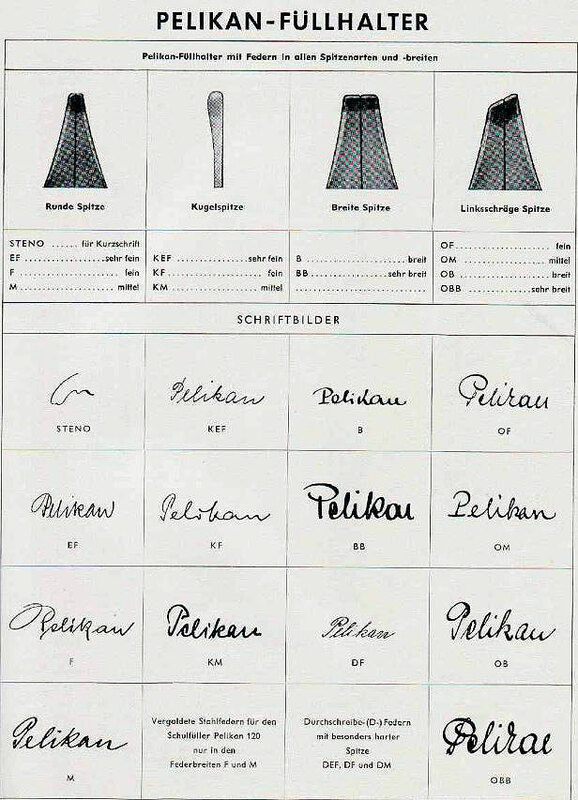 As far as Pelikan’s naming system is concerned, the first number is a series number (1xx, 2xx, 3xx, 4xx, 5xx, 6xx, 8xx, or 10xx). This denotes models of roughly the same size and style. All pens ending in ‘0’ denote a standard model with gold trim and ‘5’ indicates a standard model with rhodium trim. When the second digit is a ‘2,’ ‘3,’ or ‘4,’ it indicate a special edition, often released with some sterling silver component. When the second digit is a ‘5,’ this generally refers to a vermeil edition in the Souverän line. The exception to this is the M250 of the tradition line which is characterized by a 14K gold nib. « Pelikan M101N Tortoiseshell Red Coming Soon! It is really interesting to see that these B and BB are — as opposed to what they are now mostly — not only producing fatter lines than the EF to M nibs but are in fact stubbish. I have an old KaWeCo V16 with a 14k gold B nib that resembles the B on the first picure you provide, writing beautifully. 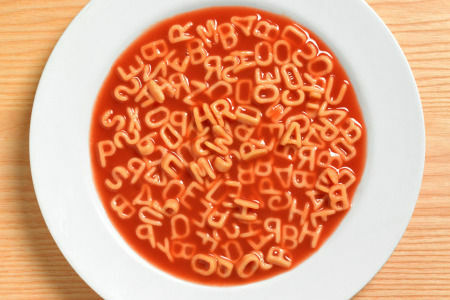 I normally do not lament about things then and now but this kind of B is adding something to handwriting that a modern B or BB from many brands including Pelikan does not, as you can see above. Thank you for providing this list and the additional information! You’re welcome. There is a great difference between the nib sizes of yesterday and those of today. My money will always be on the older nibs for the character that seemed inherent in each one. While today’s nibs get the job done, yesterday’s nibs did it with more flourish and joy. Would you happen to know the effect of having a “ball tip” on the lines? Am trying to figure out based on the chart — comparing F vs. KF — however the handwriting looks very different altogether to my untrained eyes. Hello. The Kugel nibs have ball tipping. It simply makes the tipping a bit more rounded and blobby so that it is more forgiving of the angle that you chose to write with. The line width isn’t horribly different between kugel and non-kugel versions. I think the line just loses a little character compared with standard sizes of that same era. Perfect, thank you for the fast reply. Recently ordered a vtg Pelikan with the KF tip and was curious what to expect. Thanks again for the information! You’re welcome. Enjoy your new pen! “+” symbols have been seen on some of Pelikan’s older nibs. Not super commonly encountered. The meaning is not entirely clear but this is usually seen on pens for export so it might just be a customs stamp of sorts. Don’t know that there is anything definite out there on the topic. I’m starting to think if I get anymore Pelikan pens (or pens over $200), maybe the vintage Pelikan route is the way to go. I have one, plus soon to be 4 newer Pelikans. I think I’ve spent enough on pens, but we all know how that goes. I do want another Edison pen. Once you’ve had a taste of vintage Pelikan, it’s hard to stop at just one. It was really the golden age of Pelikan’s fountain pen production. The nibs alone are worth the price of admission.